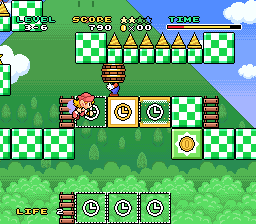 Mario and Wario is a Japanese exclusive action-puzzler that requires the SNES Mouse. Mario and Wario is a fun action-puzzler with lots of charm, challenge and content, and it's a real shame that it didn't see release outside of Japan. It has great controls and superb level design, and while it's simplistic in nature, Game Freak really managed to get the most out of the concept. Random trivia: The game was designed by Satoshi Tajiri, who later went on to create the Pokémon franchise.